*Note: In order to send a message to a Direct connection, that connection has to be established. Should you need to establish a Direct connection first, please click here. 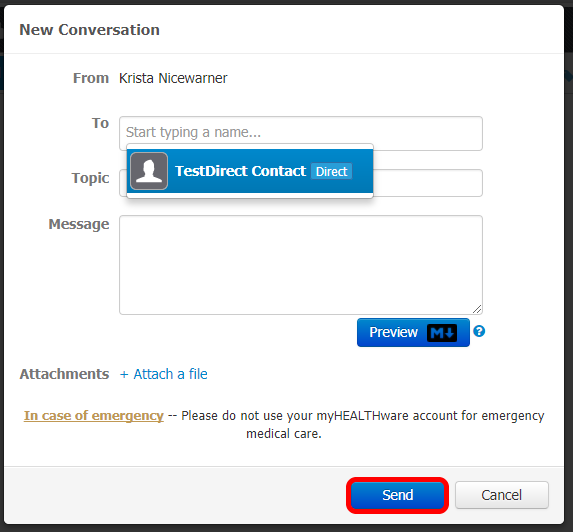 Direct Messaging can only be used from the personal myHEALTHware account (ie: not from the clinic account). In the To box, type a few letters of the Direct address you have for your contact. You will then see the entirety of the contact address display. Click on the address. Fill in the remainder of the boxes. You are even able to attach a file if needed. Lastly, click Send to send the Direct message.